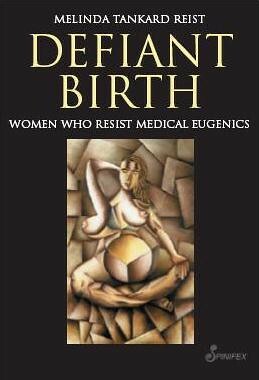 Defiant Birth: Women Who Resist Medical Eugenics, by Melinda Tankard Reist, is a book about women. It is a book about families. It is a book about resistance. It is a book about women who refuse to be told what they “should” do with their own bodies by healthcare staff, friends, and family. It is a book of stories, of women’s voices. All of the women in the book have chosen to continue pregnancies against medical advice. The medical advice is based on something about the pregnancy falling outside of the very narrow “norm” – the women’s disabilities, their “elderly” ages, a diagnosis (or misdiagnosis) of a fetus labelled “defective”. There is a woman with diabetes in her forties; a woman who chose to carry to term and birth two babies with anencephaly; women with babies with trisomy 21; women living with HIV; women with incorrect prenatal diagnoses of lethal conditions; a woman with lupus and a woman with MCTD and pulmonary hypertension; a woman with Scheurmann’s disease of the spine; a woman with severe asthma; a woman with cerebral palsy; a woman and man both with dwarfism; a woman exposed to rubella during her pregnancy; a woman with thalidomide-related phocomelia; and more. The next day I went to see my regular doctor whom I hadn’t seen yet. He was my general practitioner and I’d known him for eighteen years. I told him the news and he tightened up his face and looked at his paperwork while speaking. “Well, you’re going to terminate, right? I mean it would be the smart thing to do!” I was so devastated by his words I almost started crying. “He came bursting into our room and listened for Benedict’s heartbeat and said, “Okay, that’s all fine,” before awkwardly leaving us again. Lucky he left. If he hadn’t I might have screamed, “THAT’S ALL FINE? THAT’S ALL FINE? GET OUT OF MY ROOM! MY BABY HAS JUST DIED! IT’S NOT ALL FINE! WHAT DO YOU MEAN, THAT’S ALL FINE?” I know what he meant. Our ‘non-viable fetus’ had died, as expected. He failed to recognise that we had just lost a person, someone we loved. On returning home I went to see my doctor. I was totally unprepared for his reaction. “There will be no problem getting you an abortion,” he said. “You meet all the requirements on both physical and mental grounds.” “But,” I stammered, “I don’t want an abortion. I want a baby.” I felt shocked, belittled, and disempowered by him. “Your back is unable to support just you, let alone a baby. You will never be able to carry a baby. You will be in a wheelchair by the time you are seven months.” It was true that my back couldn’t support me at that time, and I had been trussed up in a corset-type back brace off and on for over a year, so that I could not move around freely even without a baby. […] All through the pregnancy my back continued to improve. I was now able to lift and bend, even chop wood by the time I was at the seven-month mark. The added pressure of a baby pressing on my lungs would cause more problems. This doctor also reinforced that the ‘standard of care’ in my condition would be to abort the baby. I told her immediately that abortion was not an option and that I would be carrying this baby as long as I possibly could. She encouraged me to go home and talk with my husband before making the decision, although my mind was already made up. I remember sitting in his rooms listening as he explained that there was a 25 percent chance that our child could still inherit the dominant achondroplasia gene and the dominant pseudoachondroplasia gene- a combination that they had never seen before anywhere in the world. They had no idea of what effect this would have on the baby – whether it would die soon after birth or if it would have lasting physical problems. They had absolutely nothing to go on. Having told us this, the specialist offered us an abortion. He asked us to think about whether we wanted to bring another dwarf baby into the world. I heard mum calling dad to the phone and she asked me to repeat what I had said so I told them that I was expecting. Their reaction devastated me. “Well Jo, that news has turned this day into a tragic day. You are an irresponsible and stupid girl.” They might as well have kicked me in the stomach; I was so upset that I slammed the phone down. If my parents’ reaction was bad, what chance did we have with complete strangers? Note that the stories are much longer and fuller than the bits I have picked out, which concentrate on ableist attitudes. There are many parts focusing on the authors’ happiness also! One of the most powerful tools in our toolkit as PWD is to read the world in ways that others do not; to take tools for one purpose, and to use them for our own; to resist the appropriation of our stories for the political purposes of others. To this end I am also making a conscious choice to not review the introduction or closing words of the book here. There are many stories in this book, and it is a book with multiple possible readings. I have deliberately avoided reading any other reviews while writing mine. I imagine that some may choose to read it as an anti-choice screed, just as some forced-birthers choose to see posts on FWD about the effects of ableism on pro-choice discourse as “on their side”. I choose not to read it that way. Only two or three times while reading did I get an sense of the voices possibly self-identifying as politically “pro-life”, and those moments were brief. One, who used the words “I chose life”, may or may not have been playing into the political nature of the phrase; either way, she is more than entitled to use the phrase in regard to her own personal choice. The other mentions in passing that she had worked at a “crisis pregnancy centre”, gave me a bit of a chill. But these are not the majorities of the stories, nor were they the most important or prominent parts of the stories in which they appeared. The women who speak about their religion influencing their decisions, the women who touch on much-misused catchphrases like “I chose life”; these particular sentences did not resonate with me. However, not everything in this book needs to resonate with you for the stories to have power, for the experiences to speak. It was particularly noticeable that in some cases the medical staff just assumed that the choices to continue a pregnancy must be based in obedience to external religious edicts. The stories most of the women tell are quite different; their decisions were individual and deeply nuanced, not based in unquestioning submission to some sort of “authority”. Sometimes their religious beliefs were involved, and sometimes not; in no story did I read the story-teller proclaiming that other women’s choices should be legally constrained or outlawed. They are telling their own stories. I trust readers at this blog to handle the nuance, even as I might not trust those who bring their own agendas to the work. Another issue I have with the book is the occasional mention of the experience of parenting a child with a disability as transformative for the parent. While this is not necessarily untrue, I think it needs to be written very carefully so as not to dehumanise or objectify the child, turn the child into an “inspiration” instead of a full, rounded person. I’m not sure whether that line was quite crossed – I’d have to re-read in detail, and the book has to go back to the library today! – but it skated close here and there. If you’re looking for a statistical representation of how often prenatal diagnosis is wrong or misrepresented or used to pressure women, this is not the book for you. This books isn’t statistics; it’s lived experience. The stories have been chosen because they represent those times that women are pushed around or lied to or subject to misdiagnoses and poor medical care. The issue in the book is not whether this is a majority or minority experience, but that it happens at all, and that it can be handled very, very badly. Given the number of readers and writers on this site who’ve been stampeded in the healthcare system, I think many of us do have a sense of what it’s like to be on the receiving end of that treatment. In these stories, the stakes are high: the result of the stampeding, unresisted, would have been, in each case, a wanted pregnancy lost. But I am overemphasising my nitpicking and reservations, here. In short, I recommend this book highly. The stories of disabled women, in particular, I found absolutely riveting. Their stories are vivid, immediate, at times horrifying, but more often joyful. The joy can be transcendent, yet entirely ordinary: the joy of a wanted baby, the magnificence of a disobedient woman. I would love to see a followup book, in a similar format, with a broader scope. I’d like to see a book including stories from parents in non-Western countries; from trans or nonbinary parents; from very young parents; from undocumented immigrants and refugees and Indigenous people. A book including more analysis of the intersections of class and nationality and gender and race and queerness with disability could only be stronger. Whether we’re likely to hear that book from Reist is, well, a matter for debate; but she doesn’t, nor should she, have a monopoly on this type of story. As it stands, I am left thinking that it is only the privilege that the women in this book have – mostly white, mostly relatively wealthy – that allowed them to resist as they did, to survive as they did. The stories in this book are particular types of stories, and do not represent the realities of all pregnancies labelled “abnormal” for one reason or another. However, even in its current form, I think this book should be considered a basic primer – for healthcare professionals, for pregnant people, for anyone else interested in disability and rebellion. It is not a primer about chromosome diagrams or placental configurations or how to eat or what to expect; but a primer about lived experience. The book covers what medical textbooks and pregnancy self-help books do not: the intimate, touching stories of women who rebel against crushing ableism. Above all, Defiant Birth, to me, is defiantly pro-choice. It’s a book about reproductive justice. This book deserves its place in the stable of pro-choice works dedicated to the equally valid and necessary choice to not have a baby.